For over 80 years, the GDHCC has served as the voice of the North Texas Hispanic business community. Today, it continues to serve as an advocate, as well as a resource for and conduit to business opportunities for members and partners alike. It is our goal to grow this membership base every day and continue to ensure member satisfaction at all levels of business to promote economic prosperity through member educational programs, initiatives and networking. Whether you are a large or small business, we have a membership level that is right for your business. 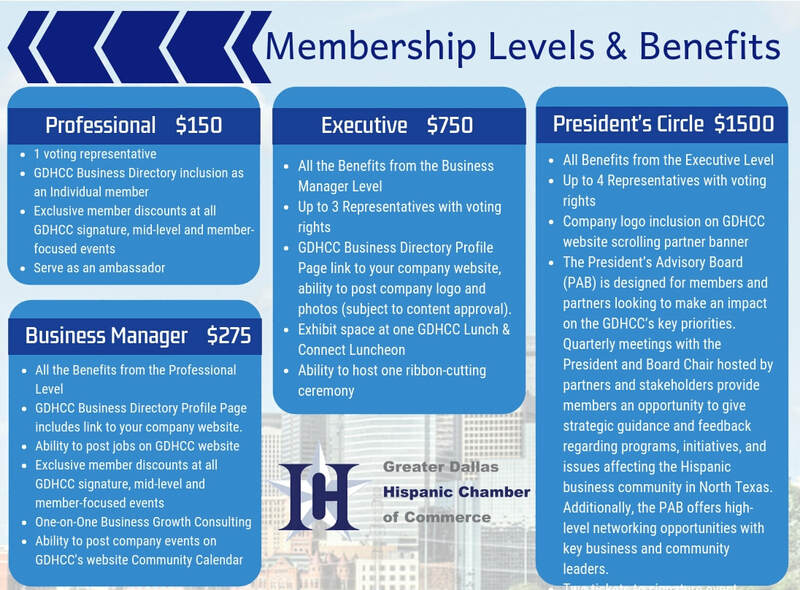 Your membership with the Greater Dallas Hispanic Chamber of Commerce is an investment in the future of your business. The more you participate, the more visibility you’ll have, the more relationships you’ll build, and the more your business will benefit!